After numerous runner-up finishes and lost leads in the final round of high profile events over the past season, Eagle McMahon entered the final round of the Las Vegas Challenge in familiar territory. He had a one-stroke lead. He had played great golf for three rounds. And he had the creeping sense of doubt that he might not be able to close it out. But McMahon executed shot after shot, dropping 11 birdies and just a single bogey, en route to a four shot victory over Joel Freeman and his first-ever National Tour victory. 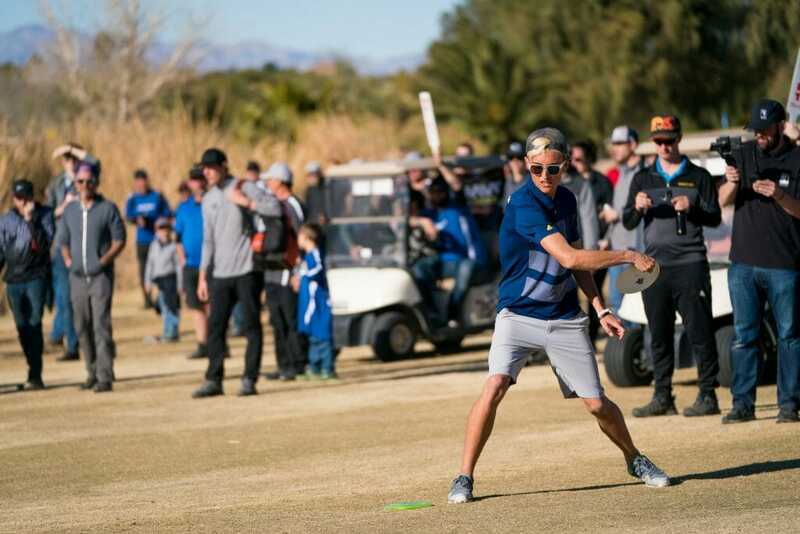 While other top pros played well (Ricky Wysocki, Simon Lizotte, and Paul McBeth all finished in the top 10), it was Coloradan Joel Freeman who finished second with a 32-under par 210 after a 7-under par 54 final round. It was easily his career-best NT finish (his previous best was 39th at last year’s Gentlemen’s Club Challenge) as he remained on the lead card for three straight rounds. Ricky Wysocki mounted a strong comeback attempt with an 11-under par 50 score (tied for the day’s hot round) that took his total to 30-under par 212, which left him tied in third place with Nikko Locastro, who ended his strong week of play with a 10-under par 51 final round. Simon Lizotte and Drew Gibson finished tied in fifth place at 29-under par 213, while Paul McBeth finished seventh at 26-under par 216. Further down the leaderboard Philo Brathwaite finished in eighth place at 24-under par 218. Nate Sexton, Kevin Jones, and Emerson Keith finished tied in ninth place at 23-under par 219. Keith tied both Wysocki and Paul Oman for the hot round on the final day at 11-under par 50. The tour heads next to the Memorial Championship, which tees off on Wednesday and marks the start of the Disc Golf Pro Tour. Comments on "Eagle Soars To First NT Win At Las Vegas Challenge"